I’ve been having some fun with my coffee setup recently. I’ve been really enjoying perfecting my technique with my Rancilio Silvia, but even though I have been producing much better espressos than when I started and have also improved my consistency, I was sill having problems with the stream ‘blonding’ too early. I suspected that poor distribution and tamping was part of the problem. My extractions often started off slow and steady, with a lovely stripy colour like dark chocolate and caramel melted together, but well before I had got the right volume collected they would suddenly turn very pale and start gushing. If you’re a real coffee nerd, you can get a ‘naked portafilter’ — a portafilter with the spouts and bottom chopped off — that allows you to see the bottom surface of the filter basket. This gives you lots of useful information about how even (or otherwise) your distribution is. If the coffee only appears from one side of the basket at the beginning, for example, you know that you’ve got less coffee on that side or you’ve tamped unevenly with less pressure on that side. You might suddenly see spurts or jets of liquid which can happen if the pressure causes sudden fissures in the puck of coffee (called ‘channelling’), allowing the water to run through without extracting much of the lovely coffee essence as it goes. I suspected that my extractions were suffering from a bit of both, particularly channelling, as the stream of liquid was speeding up so rapidly and becoming so pale. One contributory factor was probably the fact that I was using a tamper that didn’t fit my filter basket well, leaving areas around the rim of the basket poorly tamped. I got that tamper very cheaply off eBay. It was described as a 58 mm tamper, but actually it’s closer to 57 mm, and my filter basket was a bit wider than 58 mm. So I went in search of a decent tamper. Now, you can spend absurd amounts of money on a tamper. They are lovely objects, and the best ones have nicely turned wooden or aluminium handles, and precisely cut steel pistons, but I baulked at spending £80-100 on what amounts to a flat surface with a handle on it. However, as I had found with my eBay tamper, it’s hard to find a precisely dimensioned tamper for a reasonable amount of money. 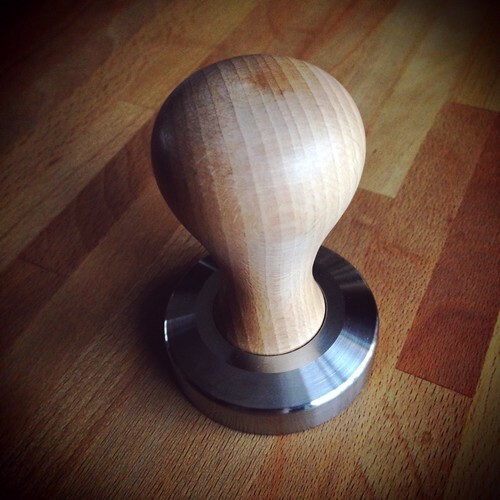 Eventually, a comment on a forum lead me to Knock, a company based in Edinburgh that makes and sells lovely tampers made in the UK. Their main tampers have precision-machined steel pistons and beech handles made from wood sourced in the UK. Even better than that, they are a very reasonable price. After dithering a bit over which one to get (I was sorely tempted by the gorgeous ‘Heft’ tamper with a black, case-hardened, ceramic-coated steel piston and a walnut handle), I went for the bundle of a ‘very simple tamper’ made to fit the 17 g VST Strada precision cut filter basket that comes with it. The VST baskets are a coffee nerd’s dream, and are specifically designed for consistent, even extractions. I had been thinking about getting one for a while, so it seemed a good opportunity. The tamper is really gorgeous, with a very nicely shaped handle, and the piston does indeed fit the basket very precisely. It’s one of those very simply designed, but beautifully executed objects that are a pleasure to handle. I’ve had a few days to find the right grind and dosing level for the new basket and the combination seems to have done the trick. I’m getting blonding much later, just at the point when I’ve got normal volume from the extraction. Rejoice! In fact, today I had really extraordinary espresso, made from Has Bean’s Brazil Espresso Perfetio blend1. The combination of the basket and tamper really seems to work. I think that the larger area and regularity of the holes in the basket must help, as does the fact that it’s designed to leave more room between the top of the coffee puck and the showerscreen. I’ve heard people say before that the Silvia performs best when it’s got a bit of room to breathe above the puck and that certainly seems to be the case. It’s also much easier to tamp very evenly over the entire surface now, while keeping it level, which must help too. I’ve actually started to use a technique I read about recently in which you use a curved edge (I use an old CD) to sweep the top of the basket after you’ve dosed and knocked it down, in order to produce a concave surface which is higher at the edges of the basket. When you tamp it, it becomes level, but starting with the edges higher compensates for the fact that the grinder naturally deposits a higher density of coffee in the centre of the basket and evens that out. It seems to work well, and also makes it easier to get an consistent dose of grounds in the basket without going to the trouble of weighing it. I’m really happy with my new espresso routine, and really enjoying the great coffee that has resulted from the change. The trouble is that I’m now tempted to buy a naked portafilter just so that I can confirm (scientifically!) that my extraction is better. Getting into making espresso is really one of those things that can be a gateway into a vortex of tweakery.